A great chicken pizza recipe is always good to have on hand. Try a BBQ chicken pizza or a chicken alfredo pizza and see what you think. A great chicken pizza makes my day. I love anything with chicken, so when I see a recipe that combines two of my favorite foods, I'm pretty happy. The beauty of chicken, and pizza for that matter, is the wide variety of ways you can prepare it. Chicken can be roasted, grilled, slathered in BBQ sauce, seasoned for fajitas, shredded, or cubed. It goes with just about any sauce too, such as tomato sauce, alfredo, garlic, ranch dressing, olive oil, pesto...you name it, and chicken will go well with it. That's why combining chicken and pizza is a match made in heaven. There are infinite numbers of possibilities to be creative! Note: We all know that chicken needs to be fully cooked to be safe, so make sure if you are grilling or baking pizza, you cook the chicken ahead of time since the grill and oven cooks the crust much faster than the chicken. Here are a few easy ways to prepare chicken for your chicken pizza (click below to find a great chicken pizza recipe or two). 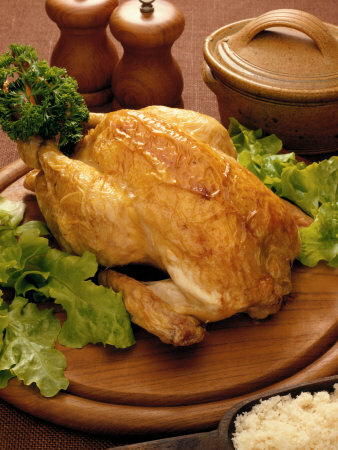 Buy a cooked roasted chicken from your grocery store deli. Pull the meat off the bones and tear it into smaller pieces. This is great for a baked or grilled chicken pizza - particularly for a grilled pizza since the crust grills up so fast (good to have already cooked and prepared toppings). This is a huge time-saver and costs between $4 - $7 for the whole roasted chicken! Baking chicken on the bone is always a little juicier and tastier then boneless. Buy a couple large chicken breasts with the bone in. Place on a cookie sheet and drizzle with olive oil and season generously with salt and pepper. Bake in the oven at 375 degrees for about 35-40 minutes until the juices run clear. Once cooled, cube or shred for your pizza. Marinade your chicken in a delicious garlic or BBQ sauce before baking. You can buy a pre-made marinade at the store in a variety of flavors, or create your own using balsamic vinegar, soy sauce, lemon juice or Italian dressing. If you plan to make a chicken fajita pizza, you can buy chicken already cut for fajitas in the meat section or the frozen food section of the grocery store. Of course, this can be a little more expensive, but saves time in the kitchen. Grill your chicken breasts and smother with barbecue sauce (homemade or a good store-bought like KC Masterpiece). This makes for a fantastic, fresh barbecue chicken pizza recipe. There's nothing better than pizza cooked over a hot flame. Throw this simple chicken pizza on the grill for a quick, delicious dinner. If you are a lover of white sauce, then this chicken pizza recipe with alfredo sauce will do you good. Who doesn't love BBQ in the summer? Combine BBQ, chicken and pizza on the grill and you have a real crowd pleaser. This unique recipe combines the classic apple waldorf salad with a pizza crust for a tasty pie. Combine the flavor of tangy buffalo chicken with a pizza dough and you have a hearty chicken pizza dinner. Garlic goes well with everything, doesn't it? Try it with chicken in this recipe and enjoy a delicious pizza.